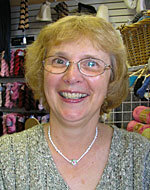 Eleanor Swogger is the former merchandise manager of Kraemer Yarns. She has retired from the company but still serves as an occasional employee. Eleanor has been knitting for 59 years and has taught at several regional knitting events. She has test knit for Kathy Zimmerman for many years. She currently teaches a private class and does custom knitting as well as knitting for family. She currently has many pair of socks on order by family members. She enjoys learning and teaching new techniques.